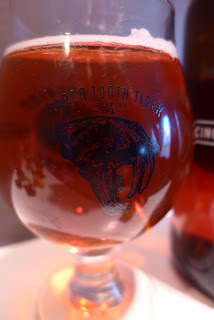 Last September when I was still trading beer, I ran across someone offering up growlers of some imperial IPA named "Saber Tooth Tiger" from Rhinegeist, a brewery I had no idea existed. Loving the name because of its geology connections and reading very positive reviews of it I was determined to get some STT. For some reason that escapes my memory, I couldn't work out a deal with the guy, so I figured why not just drive to Cincinnati and visit Rhinegeist hoping to get some STT. That next weekend I jumped in the car and did some other errands in Cincy before landing at Rhinegeist. Unfortunately they had just blown the last keg of STT- strike 1. I did see that they had awesome STT shirts... But not in my size- strike 2. 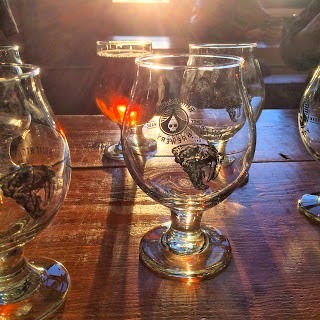 All was not lost as I grabbed some nice glassware and took home a Mosiac single hop APA that I enjoyed very much. Still feeling I had failed in my mission to get STT, I emailed the brewery to inquire when it (and shirts) would be available again: "next spring" was the response. After many emails/tweets/Facebook posts to Rhinegeist (when is it coming back???) and several months later it's almost spring and STT is here. This past weekend Andrew, Steve, and myself traveled down to Cincy to visit Rhinegeist again and finally try this beer... It was worth it. Thankfully everyone liked it, because Andrew claims that I've constantly talked about the pending STT release ever since he's known me, and it would've been a major bummer had the beer disappointed. The Big Guy: When we rolled up to the brewery we knew we had to find Jim Matt, but none of us knew what we looked like. We did what any good beer geek would do and went straight to the beer. We found a fit unassuming guy in a Saber Tooth Tiger shirt checking on all the tanks. He was doing a great job ignoring the noise of the budding party around him and focusing on the whats important, the beer. At this point we were pretty sure we had found Jim Matt, the head brewer at Rhinegeist, and the man who was making all this happen. A friend of the blog had set us up with an interview, so we got down to it. Jim took us back "behind the scenes" if anything can be considered behind the scenes at Rhinegeist. All of their brewing tanks are right out in the open, so the whole world can see the quality that they put out. I was really excited to talk with him because he was once a member of the Sun King team here in Indy and its always great to see awesome new projects from people that used to be here in the local scene. I've been incredibly impressed with how fast Rhinegeist has gone from not existing to being a full production brewery with a ton of great offerings in about nine months. They were at the point they thought they'd be in three years after about six months. Right now Jim is doing between six and ten brews every week. This means Jim and his team are stuck doing double brew days on a regular basis just to keep up with demand, and demand is high. One of my favorite beers they do is Truth, IPA. Interestingly enough, Jim started Truth as a homebrew clone of Sculpin, by Ballast Point. Like with any good homebrew clone, it never stays the same. The brewer always puts his own spin on it to make it reflect his tastes even more. Whats better than your favorite beer? Your favorite beer with even more of your favorite stuff in it. Truth is a big West Coast style IPA. Jim says that "Malt is an afterthought with Truth." Its dry, hoppy and delicious. Rhinegeist has chosen to go with cans for their packaging. They have an in-house canning line that allows them to maintain outstanding quality. One of Jim's key responsibilities at Sun King was quality control. He's done a great job of making sure everything goes well with the canning process. 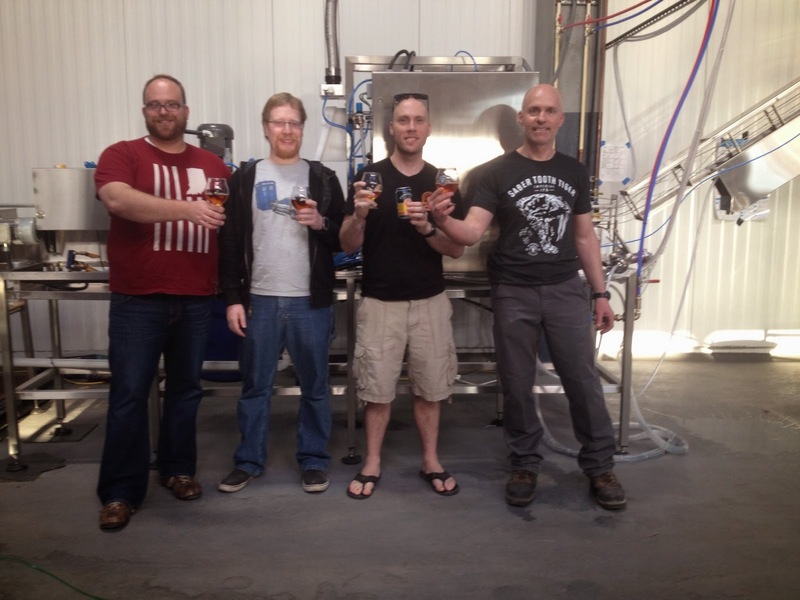 Jim also started off by homebrewing with the guys from Daredevil brewing here in IN. He was part of their club. There is a ton of history in Cinci and Rhinegeist has really stayed true to the area's roots. They've done a great job keeping some of the character of their brewery, while still making a super modern space. Community is really important to Jim and the other owners. They host yoga and beer on Sundays and even have a wiffel ball league that plays right in their brewery. A good portion of the group got a crack at this beer and has their opinions so let's get started. El Duque: If beer trees existed, this would be its fruit. Nice, slick mouthfeel added to the well balanced an tropically flavored DIPA. It's wonderful to be able to drink a beer by a new brewery of this quality. I could drink this for days on days. Great DIPA for those that shy way at the hop filled promise of such a complex brew. Professor Beer: Saber Tooth Tiger has strong tropical fruit flavors. I found it to be extremely well balanced; there is a a hoppy bitterness, but it is not palate-wrecking. I definitely recommend trying Saber Tooth Tiger if you get the chance. One of the best DIPAs that I've had, I give it a 5.